Nationally touring stand up comedian Jeff Leeson (As seen on: Global TV, CTV, Amazon Prime, Sirius XM) brings his nationwide tour to Owen Sound for a night of live stand up comedy you will never forget!! A 19 year veteran of stand up comedy Jeff Leeson is one of Canada’s most unique and respected performers. 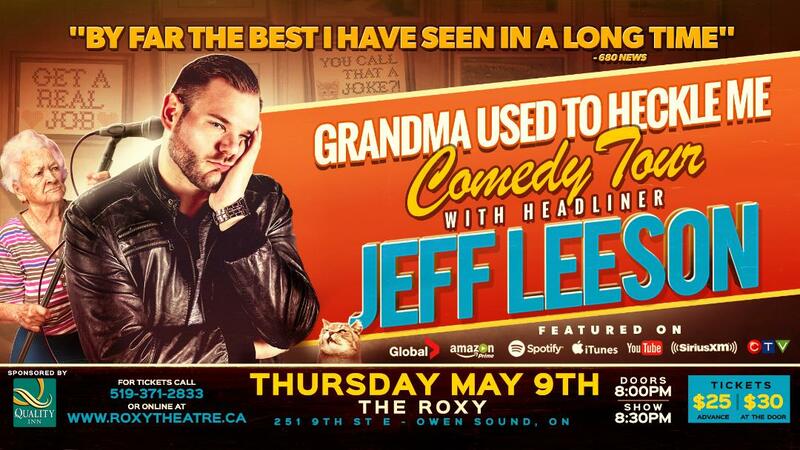 The Grandma Used to Heckle Me Comedy Tour is named after Jeff’s most recent special that is currently being pitched to TV networks and Streaming sites around the world. With an extremely impressive blend of long form improv and traditional stand up comedy this is one show you do not want to miss!! Get your tickets today!